You may have seen the video embedded above floating around online a few weeks ago, now Apple has decided to post it on it’s own iPad webpage. 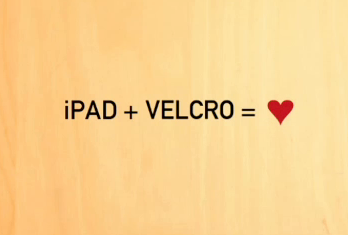 The video, created by iPad owner Jesse Rosten, shows a DIY iPad mod with velcro attached to the back in what is dubbed as “Two of Mankind’s Greatest Inventions Together At Last”. The video shows the iPad velcroed to a number of different objects, including a motorcycle while being used as a GPS device, a stove as a cookbook, and a wall as a digital picture frame. However, before you get excited a try this DIY iPad + velcro mod yourself, the Apple site does warn in fine print “Do not attempt”. This likely means you wont be getting a replacement iPad if the device happens to fall off your motorcycle. Previous Entry: Germany Demands Apple "open its databases to German data protection authorities"